Fiber Flux: Free Crochet Pattern... 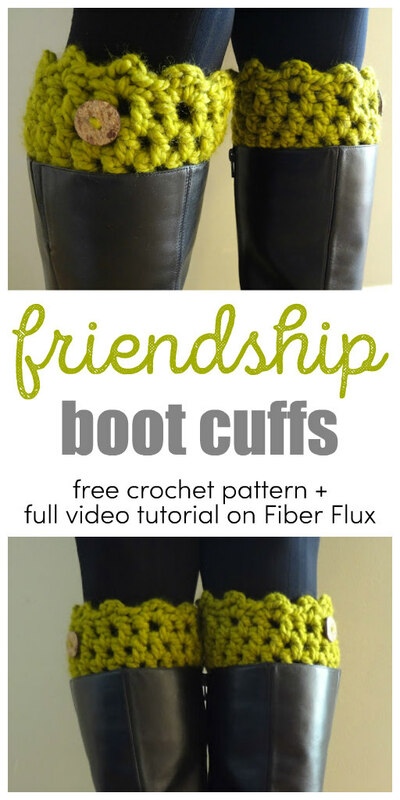 Friendship Boot Cuffs! Free Crochet Pattern... 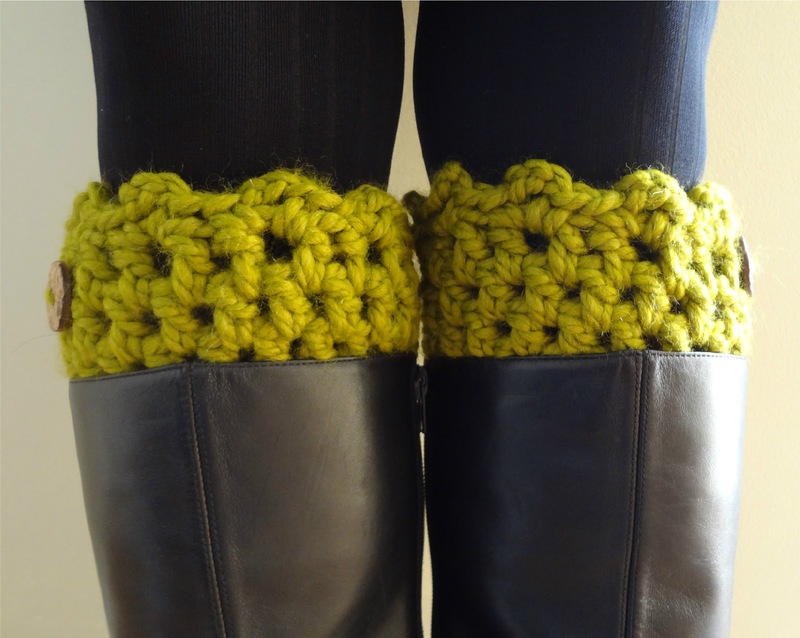 Friendship Boot Cuffs! 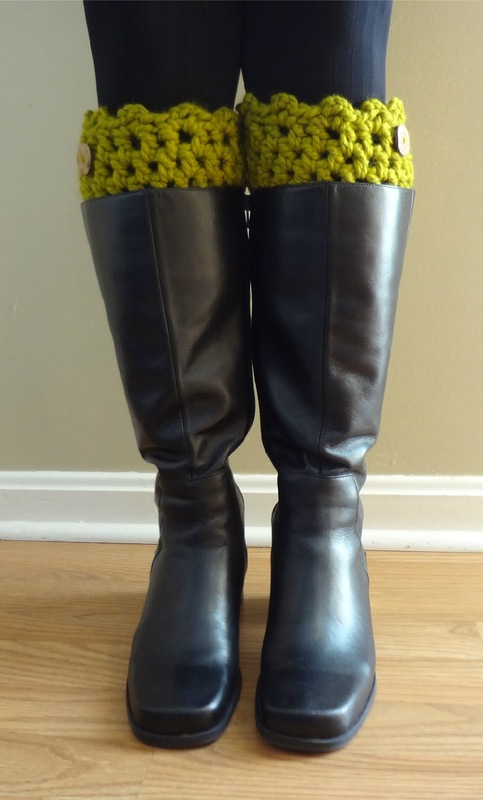 These boot cuffs will keep you feeling nice and cozy and keep the drafts out of your boots, while looking super cute. 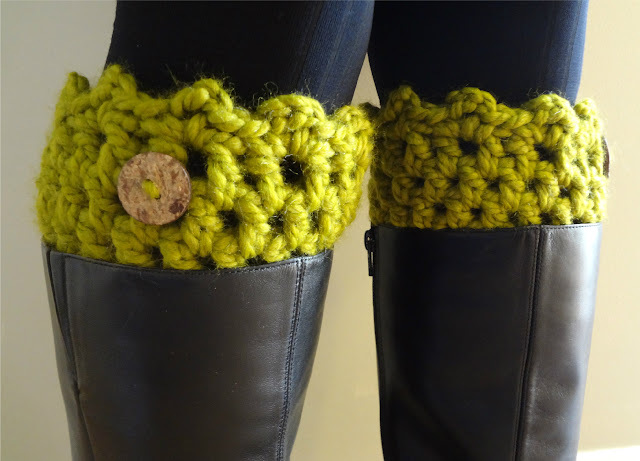 This idea was shared with me by a special friend, and from it came the Friendship Boot Cuffs! The cuffs have an optional decorative edge on top and can be accented with a special button. They work up extremely quickly in the round for looking fabulous while out and about. Ch 24, join in the round with a sl st. Round 1: Ch 2 (counts as first dc, so skip that first chain) then dc in each chain all the way around, join with a sl st to complete round. Round 2: Ch 2 (counts as first dc, so skip that first space), then work a dc in each space all the way around. Click here to learn about working into the chain space versus working into the stitch. Repeat round two 4 more times for a total of 6 rounds. In the first space, *(sc, ch 2, sc) all in the same space, then skip the next space and repeat this sequence to end of round. Join with a slip stitch and fasten off. Weave in ends. Weave in any ends and stitch on buttons as shown in the picture. I used matching yarn to attach them. Cute as can be! Thank you so much! You are fabulous too! Another pretty pattern! Hope you won't mind me linking this one up tomorrow at Tangled Happy. Happy new year! Thank you, I am so flattered, Happy New Year to you too! You are so welcome! What color did you use for yours? Sure! In your question do you mean working into the chain space versus working into the loops? If so...when you crochet into a stitch you insert your hook into the loops of the stitch (front and back unless instructed otherwise). But when a pattern specifies to crochet into a chain space, all you will do in this case is insert your hook into the space (or hole) under the chain to make your stitch. I pasted my Granny Square tutorial link below, check that out, it will give some nice visuals of crocheting into the spaces. How fun! These would make just THE BEST present to give to special trendy friends! Save some $$$ instead of buying them at Urban Outfitters, right? Absolutely agree! A handmade garment is SO much more special too! Not yet, but that is certainly a fabulous idea! Question.....where are the ch spaces your telling me to crochet in to? I don't see where you've told me to chain anything aside from the beginning foundation chain. Hi Sue! I've updated the pattern today to make the pattern a little less vague...hope that helps! Hi Sara! Just added more information to make the pattern a lot clearer...thanks! Hello. I Love all your patterns. But I was wondering what you would use with this one in particular. Thanks. Hi Sydni! 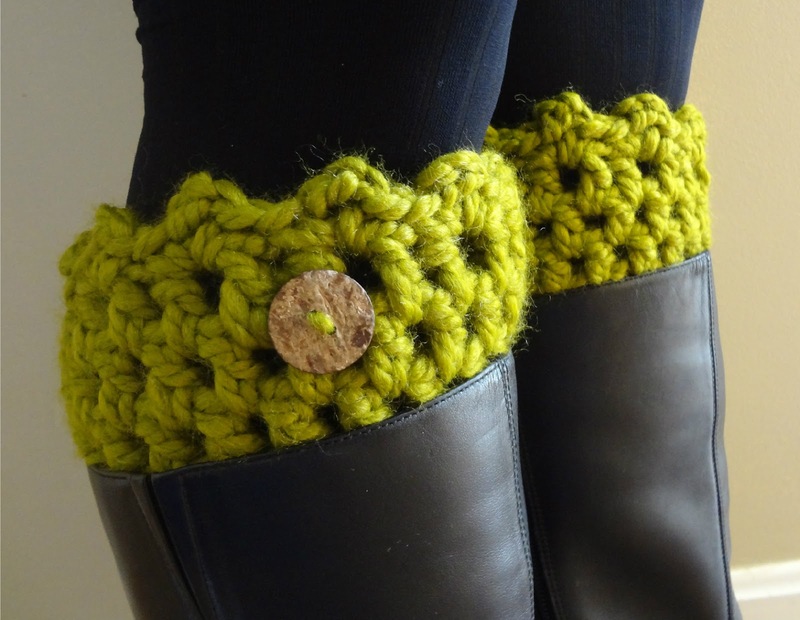 These boot cuffs are used to slip on and tuck into your boots to stay extra warm...I love mine! pattern doesn't make sense. Howcome it's becoming wider and wider with each row? Am I doing something wrong? Hi there! The chain 2 at the beginning of each round counts as a dc, so be sure to skip that first space, and it should be nice and straight. Hope that helps! i love these!! they are sooo fabulous!!! but a quick question when i started (after the irst join) the hole or opening didnt look very big is that normal?? These look amazing it will match my cowl i just made. But i'm also confused just like the Anonymus & Sue in March 22 comment. I don't understand where my "chain space" would be on the foundation chains. I did it in the "hole" you specified under the chain, but that's just that... a chain. And it looks off (DCs look too close together). Wish i could post a picture of what its looking like. It does NOT look like yours. What im thinkign of doing (if you don't respond soon) is skipping a chain. Hope it looks good. Thank you! Hi, sorry for any confusion, I just updated the pattern with lots more info to make it more clear, I think it was rather vague before, and I hope this will help! Many THANKS for sharing this pattern..... I was really happy with the finished look n was super easy to do! I'm sorry, I feel dumb, but I too am confused by the chain space. I understand, as in your tutorial, the concept of crocheting into a chain space. But if I dc in each chain for the first row, where is the chain space in the second row? Am I supposed to chain between each dc on round 1? but then I probably ought to skip a chain each time, too, or it would be double number of stitches by the end of round two. Or ,... what am I missing. I've re-read it several times, out loud even and I'm still foggy on that. Oh my goodness, don't feel dumb! Yes, in the the second round you work in between the double crochet posts, that forms the hole or space. I will be making a video on this soon, I will let you know as soon as it is up, I was thinking it would be more helpful to show you and others that way. There is so much advertising on the left side I can't get all the instructions printed. It leaves words half off. Click on the green "print friendly" button at the bottom if the post. That way you can print only what you need! Would this pattern fit someone with 13' calves? hello, i bought crocket hook N-9.00 mm but it seems too big. is this the right size for this pattern? Hi hun I was looking for a way to widen the circumference I need 16.5. Is there a magic increase number for me that keep the pattern intact? Since you double crochet in every chain just add to your starting chain to get the size you need. The largest hook I have is a J 6mm. So I had to add 12 chains to get the 15 circumference. Great tutorial. Each step so easy to follow. Thank you. I loved this tutorial! 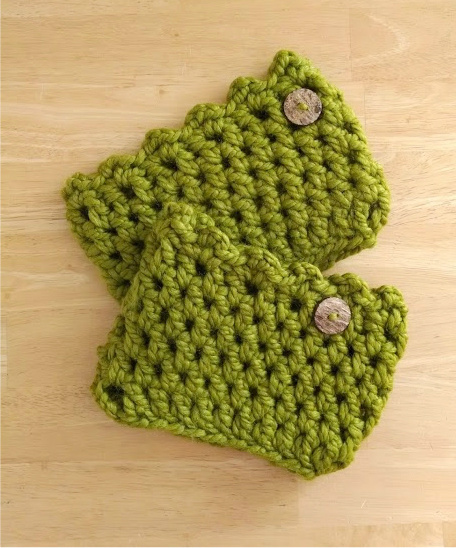 I've used it a few times, but this last time was different because I made boot cuffs for my 5 year old granddaughter. It was so easy to adjust the pattern. I simple measured her calve and ended up with a starting chain of 33. She loves showing them off with her new boots - my little fashionista! 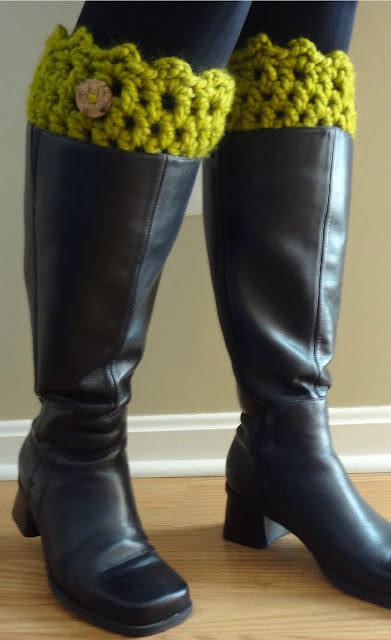 You can see pictures of them at https://faithtrustandbreastcancer.blogspot.com/2017/01/philippians-27-part-2-baby-bs-boot-cuff.html. Naturally I linked right back to this page! Thank you for sharing this wonderful pattern!